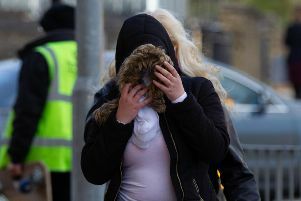 A woman who was in charge of a Siberian Husky which savaged a young girl in her living room has been banned from keeping dogs for five years. Sarah White (37) of Hinchcliffe, Orton Goldhay, was also given a four month jail sentence, suspended for 18 months at Peterborough Crown Court today. She was found guilty of being in control of a dog which was dangerously out of control at a previous hearing. The court was told the White was looking after the dog for a friend when it attacked 12-year-old Georgia Sigourney in October 2014. White had left the dog asleep on the couch to run an errand at a neighbour’s house, when Georgia accidentally leant on it’s tail, causing it to ‘savage’ her face. Georgia needed 50 stitches on her face following the attack, and has been left with permanent scars. Judge Sean Enright, sentencing, said White had shown no remorse following the incident. However, despite the terrifying attack, Georgia’s dad, Chris, sent a statement to the court, saying he did not want to see White go to jail. Roger Harrison, defending, said White wanted to express her sorrow and compassion for what had happened. Mr Harrison said: “The dog had been gentle, and the owner said it had always been gentle. Since the attack, White has bought a Staffordshire Bull Terrier, which she will have to give up following the ban.